Beautiful seaside, golden beaches, and marvelous mountains: Abruzzo has it all—and more. Ranked as one of the best places in te world where to live, this is a truly intriguing land, extraordinarily rich in natural beauty, great art, splendid urban architecture, secular traditions, and a culture enriched by hospitable people. Here, people pull their chairs out into the street, kids play outside, and people do their shopping at street markets. And the cooking revisits ancient recipes for preparing fish, lamb, goat, and wild boar. Abruzzo has an inexhaustible wealth of artistic gems, suggestive ancient traditions, and a wide variety of flavors. Its landscape ranges from the vertiginous white summits of Gran Sasso, Majella and Sirente to green hills quilted with splendid villages that drop off dramatically into the intense blue of the Adriatic. Paradise pure and simple, Abruzzo is home to many species of animals and birds that have survived the threat of extinction, as well as an extraordinary variety of plants. Abruzzo has always been a wild landscape, one of rare beauty. All who encounter it remain intrigued, forever mesmerized, almost bewitched, like countless foreign writers and travelers who visited the region and wrote fabulous passages about it. That is to say nothing of Abruzzo’s native sons and daughters, includng Gabriele d’Annunzio, Ignazio Silone and Mario Pomilio, to name just a few who may be better known in the U.S. Recently the Huffington Post published an article on the 12 best places in the world to retire. The American news outlet awarded Abruzzo fifth place, behind Algarve, Portugal; Cayo, Belize; Medellin, Colombia; and Pau, France, beating out seven beauty spots in Central America and Asia. 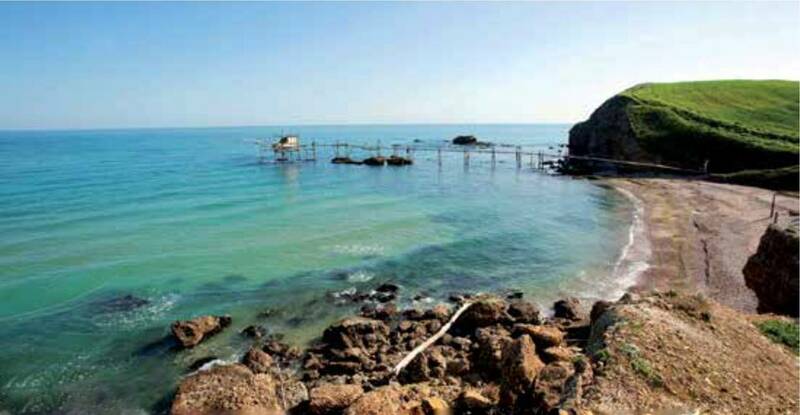 According to Huffington Post, Abruzzo stands out for its beautiful seaside, golden beaches, and marvelous mountains. The region’s human side doesn’t hurt either: without huge crowded cities, major industry or pollution, the air is healthy and the landscape dotted with vineyards, small towns, stone houses, and various castles. Here, people pull their chairs out into the street, kids play outside, and people do their shopping at street markets. The cooking revisits ancient recipes for preparing fish, lamb, goat, and wild boar. to live, too, so the Huffington Post’s flattering assessment should come as no surprise. After centuries of being labeled a harsh land of imposing and remote mountains where only gruff pioneers and shepherds could carve out a life, in the last few years Abruzzo’s appeal has been ascendant. The misconception stemmed from a dearth of transportation routes, which, in the past, made it hard for the region to develop. But all that has changed in the last forty years with the creation of highways making it possible to travel from Rome to L’Aquila in an hour, and to Pescara, Chieti, Teramo, and other cities on the Adriatic in two hours. Now Abruzzo is at the center of Italy, thanks also to an airport connecting it to the rest of the country, Europe, and the world. Abruzzo’s visitors – tourists are coming here in growing numbers – discover a truly intriguing land, extraordinarily rich in natural beauty, great art, splendid urban architecture, secular traditions, and a culture enriched by hospitable people. Now all one needs to do is choose between climbing the sheer cliffs of Gran Sasso or playing winter sports in the mountains and high plains; between visiting the wonderful cities of art or exploring its enchanting villages (out of 253 listed in the exclusive Most Beautiful Villages in Italy Club, a whopping 22 are from Abruzzo); between lakes or rolling hills; between vast sandy beaches to rocky shores on the green coast where an emerald sea is speckled with ‘trabuccos.’ Beachgoers will find it all along Abruzzo’s 100-mile long coastline. In short, visitors will discover that Abruzzo has a lot more variety than they might have imagined, perhaps under the illusion that it was still stuck in its centuries-long isolation. Instead they will find a striking, kind, and welcoming people and a cornucopia of surprising gems, as surprising as the discoveries archaeologists have made in the last two decades, digging up numerous necropolises intact. Rather than crumbling funerary objects, they’ve turned up sophisticated ruins, precious jewels, and priceless ornaments, evidence of the Italic civilizations in the region. Indeed, centuries before Christ, the ancient populations of the region famously joined forces in order to fend off the Romans during the Social War, before eventually forming alliances with Rome and its citizens. Since the Bronze Age, Abruzzo’s historical importance has been embodied by places such as the region’s capital city, L’Aquila, the queen of the Apennines. The city (its name menas ‘The Eagle’ in Italian) is currently rising out of the rubble left by the disastrous 2009 earthquake, and is more beautiful than ever. 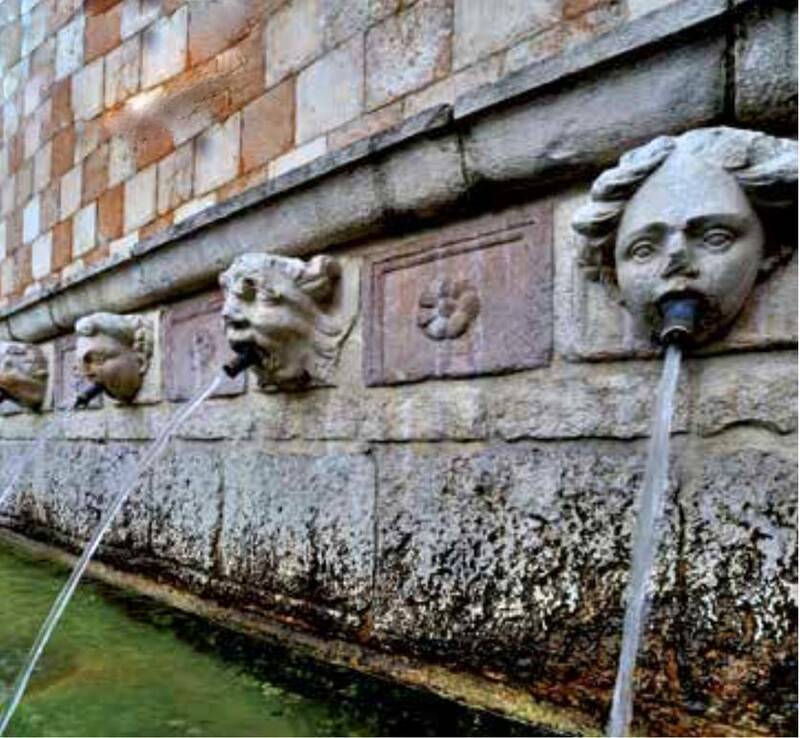 One of the most precious artistic sites in Italy, its vast and important historic center is surrounded by almost 4 miles of city walls that have now been magnificently restored. L’Aquila’s singularity dates back to its founding in 1254, when 99 surrounding castles (castrum) united, each doing its best to erect its own neighborhood in the new city, following an harmonious – rather than haphazard – urban plan. In the history of urban planning, L’Aquila was the first city to be fortified and constructed at the same time. It wouldn’t happen again until 1703, when Saint Petersburg was founded. The second largest city in the southern Kingdom after Naples, L’Aquila enjoyed broad independence. It had its own laws, fiscal privileges, and the freedom to coin its own currency. For three centuries, until the middle of the 1500s, it was one of the most prosperous and important cities in Europe, trading wool and saffron. By the latter half of the 1400s, it had opened both a university and one of the first printing presses, thanks to a student who interned with Gutenberg, the inventor of the press. In 1294 in L’Aquila, with Francis of Assisi in attendance among others, Celestine V was crowned pope. One of the most luminous spiritual figures in history, Celestine instituted the first Christian jubilee, the ‘Perdonanza’, which, thanks to a papal bull honored by local authorities, has been celebrated annually for 722 years in L’Aquila. Celestine V, the first Pope to resign his post five months after being elected, has made a powerful impact on Abruzzo’s spirituality. His magnificent hermitages were bravely carved out of the rock of Majella and Mount Morrone, and, in the 1400s, his spirituality was reinforced by the Franciscans, San Bernardino da Siena, and San Giovanni da Capestrano. L’Aquila is now a vibrant cultural center, home to prestigious institutes of music, theater, and film; a research university; and a nuclear physics laboratory located underneath Gran Sasso, where scientists all over the world study the origins of matter in the absence of cosmic rays. Heading away from L’Aquila in the direction of Pescara and the Adriatic, you’ll encounter wonderful Romanic churches along the road skirting ancient Tratturo, where flocks of sheep were once herded across nearby region of Puglia. Inside the churches are extraordinarily beautiful frescoes, paintings, and sculptures. Who would have thought that so many fine artists could have been born in a place believed to be as isolated and backward as Abruzzo was, artists who have no reason to envy the greats of the 14th century and Renaissance. Not to mention major goldsmiths, carpenters, potters. Their works turn up on treasure hunts through small country churches, monasteries, magnificent cathedrals, in places like Sulmona, Chieti, Atri, Teramo, Tagliacozzo, Penne, Giulianova, Città Sant’Angelo, Ortona, Guardiagrele, Lanciano, Vasto, and other centers. Once in Pescara you find yourself in the “jewel of the Adriatic,” a lively, dynamic city that trades freely with towns and cities on the Balkan coast. As a transport hub, it serves a large commercial and industrial area that stretches as far as Chieti, a beautiful ancient city that, like Pescara, has a good university. 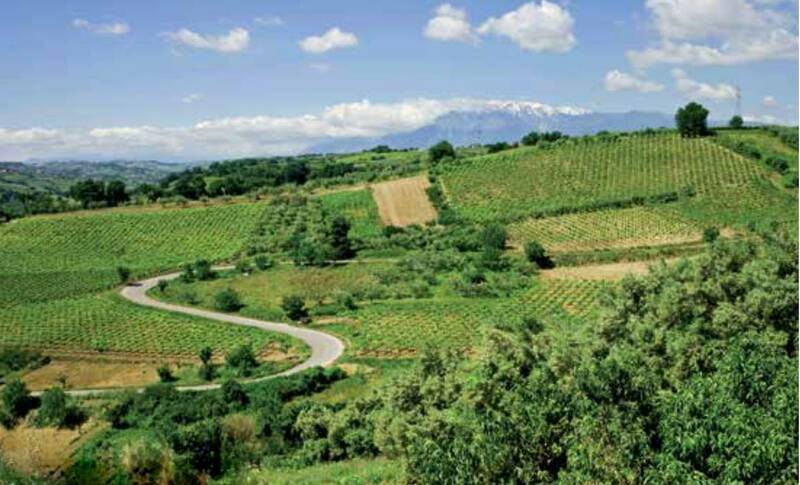 The strip of hills in Abruzzo is dominated by a series of orderly vineyards; the region produces excellent wines that compete at top levels around the world. Wine is one strong suit of the region. Others are oil, pasta, salami, and traditional sweets. Abruzzese cuisine revolves around excellent, grass-fed meat as well as tasty legumes and vegetables. Land around Fucino Lake is farmed. The region’s long tradition of great cooking owes a debt of thanks to the famous cooking school at the Villa Santa Maria. Excellent places to taste Abruzzo cuisine can be found in the city of Teramo and in the countryside. Get going, Abruzzo’s waiting for you!